It has been a busy six months, and we have several exciting updates for you in this mid-year report. First, we are pleased to report that as of this month, Palayam Foundation has surpassed $500,000 in total giving over its lifetime. While this milestone is incredible to reflect upon in and of itself, what we believe is truly remarkable is the enormous impact our family has made over a sustained period in our home communities and around the world. We have continued this impact in 2017. At mid-year we are a little over halfway to our yearly giving goal, and are on track to award $70,000 in grants by the end of 2017. So far we have supported projects initiated by Aparna, Geetha, and Kousalya through our Mukund Devan Family Projects Program, and have solidified our partnerships with the National Alliance on Mental Illness in the US and with Altius Foundation in India. We have also developed new initiatives with existing partners. We have been in talks for several months with Altius Foundation to launch a higher education scholarship to provide further support to underprivileged youth (particularly girls) who might otherwise not have the access or support to complete their studies. This initiative has tentatively been named the M.S. Rajagopalan Family Scholarship in order to honor Rajagopal Thatha/Appa's passion for and commitment to education. We hope to bring you more information in the coming months. Lastly, the time has come to call for new board members. Serving as a board member is a great way to learn more about what we do and to have a hand in shaping our future strategy. For the coming year, we will implement a Board Member Philanthropic Allowance program, whereby each member is allotted funds to donate to the nonprofit of their choosing. Our goal is to give new board members a hands-on experience with philanthropy. Our current board members provided spirited, thoughtful guidance and were instrumental in shaping our current direction. We hope to see new faces and perspectives in the coming year! 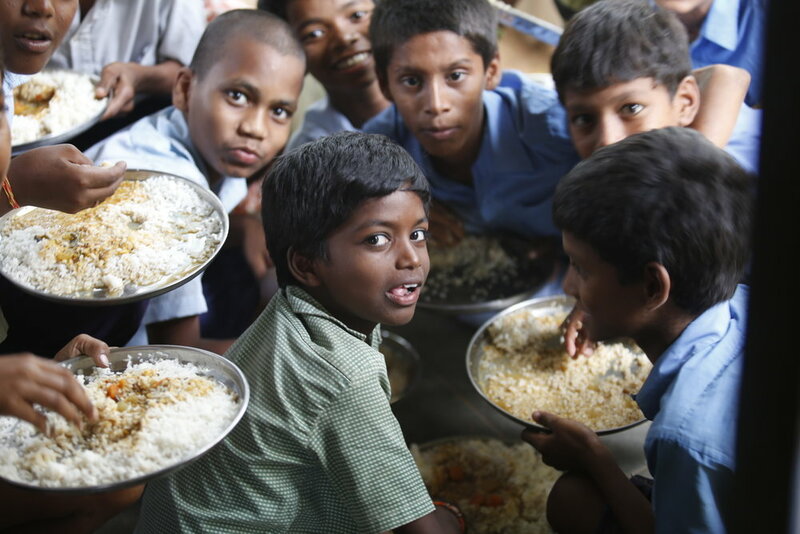 Today, Akshaya Patra provides free mid-day meals to 1.6 million children at over 13,000 schools, and has a presence in 30 locations across 12 states in India. Classroom hunger is a problem that affects the entire nation. One third of the world’s undernourished children are from India. Since the conflict began, almost 1 in 3 people in South Sudan have been displaced. Some 3.6 million citizens have been forced to flee their homes: more than 1.5 million people have escaped to neighboring countries in search of safety, and more than 2.1 million are trapped inside the warring nation. South Sudan is now the third-most fled country in the world, behind Syria and Afghanistan. One of the most important values that has been handed down generations in the Palayam family is an open door treatment to sharing food with, not only anyone that comes home, but more importantly with people that go hungry. For decades, every occasion in the family has been marked by donating to organizations and temples that work on making free food available for those who need it. In keeping with this tradition, I submitted my Mukund Devan Family Projects application to respond to calls for aid to famine-ridden South Sudan. CARE reports that 6 million people are suffering from extreme hunger in South Sudan, half of the country's population. CARE was found to be an organization that could use token funds in the best way possible. Since the famine crisis began in 2013, CARE has assisted 350,000 people across the region, primarily assisting mothers and children under five years old. The U.N. appealed for $1.6 billion to assist 4.6 million people in need in 2015, but the effort was only 62 percent funded. Only 88 percent of the $1.29 billion requested for 2016 had been funded. Many humanitarian organizations, including CARE, are partnering with the U.N., using both private contributions and funding from the international community, to address the urgent needs of innocent people in South Sudan. Almost 5 million people are currently at risk of going hungry. With famine already ravaging parts of South Sudan, people are dying of hunger — another 1 million people are on the brink of famine. Groundwork USA is one of a few organizations that flips the lens of environmentalism from protecting of large swaths of public land to impacting people's lives through improving green spaces in their own backyards. The traditional conservation and environmental movement is largely homogeneous and White-led because it has a myopic understanding of which lands deserve protection and for what purposes; typically these lands are larger tracts of lands, inaccessible to a majority of the US population, and used for hiking, backpacking, and other specific forms of recreation. 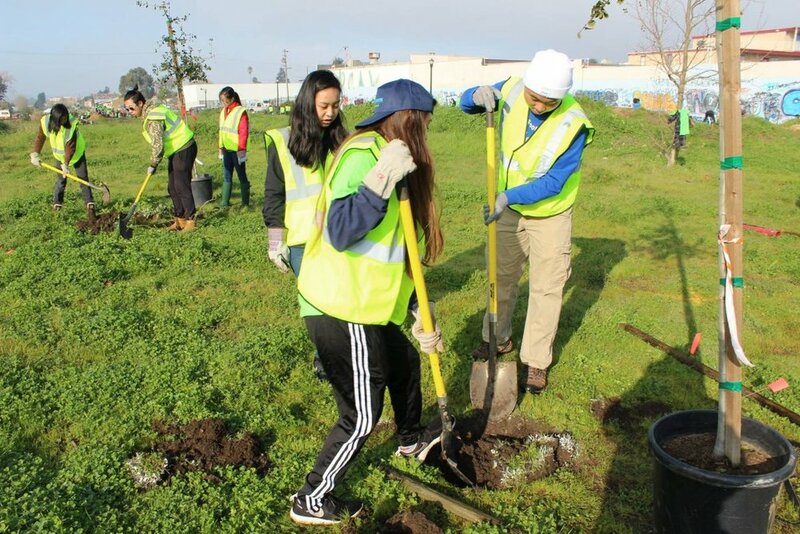 Groundwork USA teaches us that a tree in Yosemite is not more valuable than a tree in Richmond, CA. In fact, that Richmond tree needs more care and cultivation because it and other pieces of the ecosystem foster a healthy Richmond community. Groundwork is making conservation relevant to communities of color, who have historically been left out of decisionmaking processes, who cannot often access public lands, and who have experienced exclusion in these spaces. In fact, I would argue that Groundwork is redefining "conservation" to be more meaningful to everyone. Groundwork itself is also a very racially and ethnically diverse organization (one of few, again, in the conservation space). Lawrence, Massachusetts youth clean up their local waterways as part of the Groundwork Lawrence Spicket River Cleanup 2015. Groundwork's initiative 'Growing the Next Generation of Environmental Leaders' focuses on building connections between diverse young people and the outdoors to foster stewardship and community betterment. As part of this initiative, Groundwork USA was able to use funds from the Mukund Devan Family Projects Programs to coordinate and send its young staff to a conference called People of the Global Majority in the Outdoors, Nature, and Environment (www.pgmone.org). There, Groundwork staff and interns were able to build connections with other organizations and gain tools for culture change in the environmental movement. My life's work is to support environmental and outdoor organizations in creating a more socially and environmentally just future.I am personally driven to support Groundwork USA in this initiative because I am a person of color who has been in the minority in the outdoor and environmental field, I know what it is like to be "the only chocolate chip in the cookie." PGM ONE served as a space where the chocolate chips were able to gather together and show up as 100% their authentic selves. I was personally excited to support younger folks in building networks of people with similar identities because I know what it's like to feel isolated in this field. I know others feel the same. My goal is for my child and other kids of color not to have to think twice about a career in (or passion for) the outdoors and the environment. And I feel it is my responsibility (and others in my generation in this field) to open doors for them. Groundwork Richmond Green Team youth plant trees along the Richmond Greenway. Through the support of the Mukund Devan Family Projects program, I'm very proud to help advance the causes supported by Groundwork USA. Our partnership with Altius continues in 2017. This year our funding will be directed to three areas: Altius’s Karka Math Labs, Gift-A-Future scholars, and our newly implemented M.S. Rajagopalan Family Scholarship. The Karka Math Lab provides an innovative, self-paced learning environment for children in underserved communities. With our support, Altius launched Math Labs in various school settings, and have had proven success, evidenced by increased graduation rates and higher scores. We will continue to support this innovative, impactful program. Gift-A-Future provides underserved children a chance to complete their primary school education. However, there is a need to support students who wish to pursue a higher education as well. To this end we have, in partnership with Altius, launched the M.S. Rajagopalan Family Scholarship. We will leverage Altius’s knowledge and infrastructure to identify students who demonstrate both need and the potential to complete a higher education. We particularly hope to support girls, who typically face many more social and systemic impediments to continuing their education. Our budget for charitable distributions this year is $70,000. To date, we have given $37,964 to four charitable causes globally. Our largest single donation so far this year went toward solidifying our partnership with the Altius Foundation. The remaining was in support of three Mukund Devan Family Projects (MDFP) causes: Groundwork USA, CARE, and the Akshaya Patra Foundation. Currently, we are 54% toward our total charitable budget for the year. Since 2002, the Palayam Foundation has given out $506,525 in grant money. *2017 figures are year-to-date. 2017 is the first year that the Palayam Endowment has been managed under the new Investment Policy Statement (IPS), crafted and ratified by the Board late last year. The underlying function of the IPS is to create a framework for the responsible management of the Endowment investment portfolio. The IPS states that the 2017 goal is to increase the Endowment by 6.5%, while providing stable returns and low overall correlation to benchmark asset classes. While we have gained ~3.5% year-to-date, we continue to be cautious with our allocations given that global financial markets continue to hover near all time highs. As a result, we are ~50% vested, providing significant "dry powder" and allowing us to be opportunistic as market conditions change. Our portfolio is well balanced across Global Equities, Fixed Income Currencies and Commodities (FICC), Real Assets, and Alternatives. The Finance Committee continues to research and develop strategies to implement "Responsible Investing" factors including Environmental, Social, and Corporate Governance (ESG) investing, as well as Sustainable and Social Impact Investing. We have made our initial investments in funds that focus on Sustainable Infrastructure development; including wind and solar power. As we evolve our Investment Policy toward this goal of Responsible Investing, we will implement these characteristics into the Endowment. We believe that our Endowment's profile should reflect our values as a Family and a Foundation, and we will continue to work toward that goal. Thanks in large part to our current board of directors (Vikram, Jamie, and Nivy) the Palayam Foundation has had an incredible two years of growth. We would like to thank our current board members for their service, and to invite other family members to take a position on the board at year end. The responsibilities and time commitment of a board member are relatively small, but have a great impact. This year, we also wanted to find new ways to give board members hands-on experience with philanthropy. To that end, we will be implementing our Board Member Philanthropic Allowance. Starting in 2018 we will build into our budget an allotment for each board member to donate to the nonprofit organization of their choice. We feel this will not only increase engagement and learning, but is also a way for the family and executive team to show our appreciation for those who choose to serve. As in the past, our ideal would be to have representatives on the board from all family groups--the elder gen, cousins, and spouses. Some current board members may stay on to provide continuity and help new board members orient themselves. We recognize that you all have busy lives, with growing family and professional responsibilities. But we encourage all of you to consider coming on board and taking a role in this family endeavor. Please send and email to executive@palayamfoundation.org by September 1, 2017 with any questions or to express your interest.